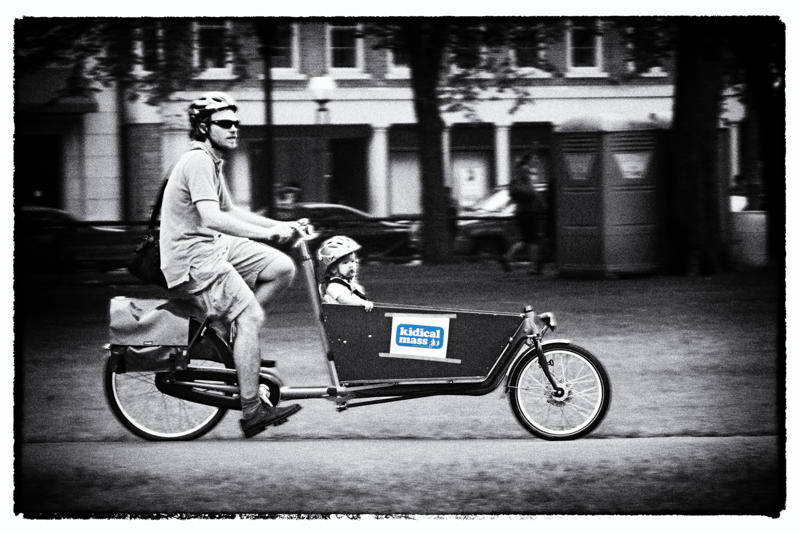 My name is David, and along with Kristin and our daughter L., we are a two-cargo-bike family. We own a Surly Big Dummy with Peapod child seat and a Madsen Bucket bike. We have had the Big Dummy since March, and I primarily ride for commuting to/from work and for short trips around town. We've racked up a bit over 500 miles on the Dummy so far. We got the Madsen just about a week ago but it already feels normal to have two cargo bikes. Kristin is the primary rider on the Madsen, and she prefers it over the Dummy for lower step-through height, more upright riding position, and lower perceived center of gravity. Kristin has used the Madsen for taking L. to play group and for similar trips. L. is pre-verbal, so we do not have her opinion on her riding experiences. This past weekend was the “Moving Connecticut Day of Action” and there was a gathering on the New Haven Green. 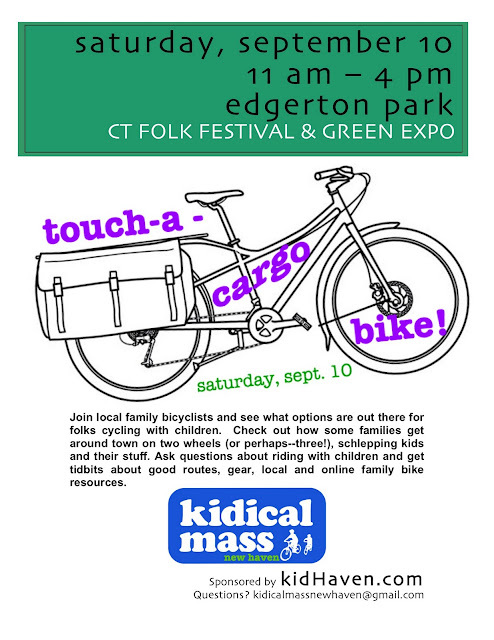 As part of this gathering, Kidical Mass wanted a representation of family bike / cargo bike options. We had Xtracycles and a Christiania trike and some trailers and a Madsen. Sara was generous to lend out her bakfiets as part of show and tell, and we got to try riding it for the weekend. With me being used to the Big Dummy, I didn't think I would be surprised by the long wheelbase on the bakfiets, but it truly is a long bike. Turning the bike around is a little different than what I've come to expect from the Big Dummy for two reasons. The bakfiets has hard stops on the steering to prevent you from oversteering and dumping the bike over. 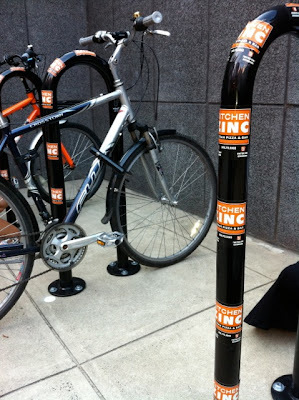 This is a good idea, but in practice it means you cannot steer the bike as hard as you would sometimes prefer for making a tight radius when parking or backing up. The second difference is that the Dummy has a handle on the front of the deck, and when I'm trying to negotiate a tight spot I just grab the handle and drag the rear wheel wherever I want to repoint the bike. In retrospect, I just realized there is a handle near the base of the seatpost on the bakfiets, and I could probably use that handle to get the same effect. Madsen and see if this reduces the bump noise. At speed, the bakfiets remote steering is intuitive if you can relax enough to let the bike teach you. If you carry enough speed into the corner you can do some subtle leaning, but you also have to do some steering. I did a lot of minor wiggling back and forth while I first felt it out, and by the end of the second day riding, it felt natural. The internal-geared 8-speed hub was more than enough for around-town use for fairly flat to minor hills. On my second day of riding I gave myself a bakfiets challenge. New Haven has a neighborhood referred to as Science Hill (a lot of Yale science labs are housed there). I decided to try riding up Munson, onto Prospect, and down Edwards. I do not know the actual altitude gain and loss or the grade, and will leave that to somebody with GPS skills. I started uphill from Winchester in fourth or fifth gear. Just past Mansfield I was down to third and soon went down to second and first. By the end of the hill I was cranking as much as I could in first and doing a lot of weaving. The bakfiets can climb hills, but I recommend going around instead. I did this in sandals on flat pedals, with no toe clips as a realistic test of the Dutch bike experience, where people bike in their everyday clothes. Now we were ready to go down Edwards, which is about the same slope, with glassy smooth pavement. The bakfiets does not have a speedometer, but we were over 20 mph. The Shimano drum brakes front and rear did a splendid job of bringing the bike to a smooth halt at the bottom. Something not entirely unexpected happened with the steering at high speed, and there was a noticeable shimmy. The shimmy is not in any way a dealbreaker, and in normal usage I never noticed this. We rode up the Orange St. bike lane en route to East Rock Park, and got some smiles. Riding cargo bikes, we are used to getting laughs and smiles and waves. Riding the bakfiets brought this experience to a higher level. I believe this is due to the front-box design where people can spot a very different bike, compared with our Dummy and Madsen, where the front of the bike looks 'normal' to oncoming traffic or casual observers. We had people wave, we had people point, and on the ride back from the park, we had somebody come alongside in a car with the passenger shooting an iPhone video while saying 'that's one cool bike.' When parked we would get questions, and a lot of people assumed the wooden box meant we had made the bike ourselves. Almost home, a kid yelled that he wanted to try a ride in the box. We also got to experience something very practical about having the cargo in front of the rider. On the way back from the park, L. started crying. My first instinct was to pull over. Then it occurred to me that I could reach her pacifier without having to stop, and this calmed her down. I had already placed her sippy cup and her snack container on the bakfiets seat bench, and by having her in front I could see if she was tempted to throw them overboard. It was really great to try the bakfiets for a weekend. I am on Xtracycle's mailing list, in particular the one that sends out notices about Car-Lite and Car-Free Living. Scrolling down the page from today's e-mail blast, I got excited reading about Marin County's upcoming CARGO BIKE JUBILEE. 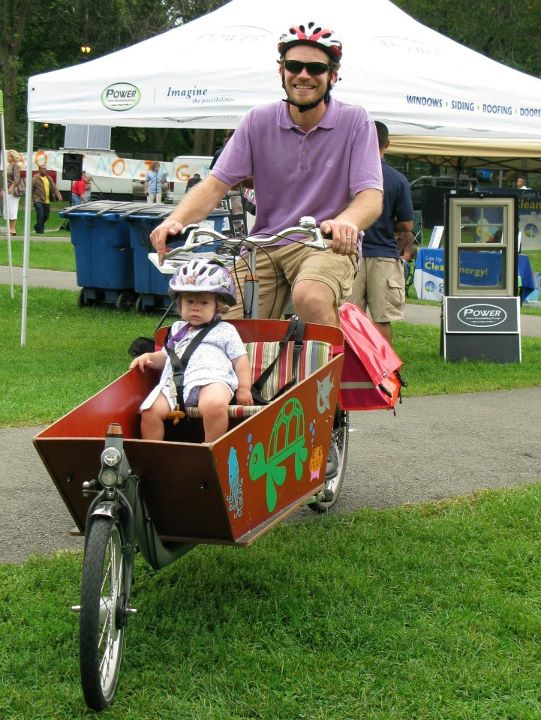 Reading about the event made me realize the brilliant pairing: similar to our Touch-A-Cargo-Bike event WITH Portland's Fiets of Parenthood. It got me excited about next summer. Yes, we need to plan one of these. 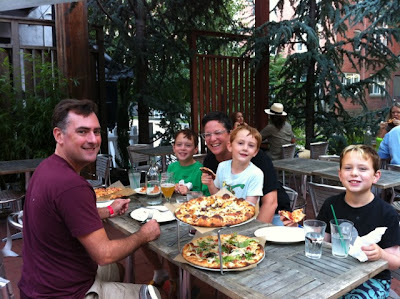 Imagining our take on the Family Bike Obstacle Course, I could not help but be drawn to "Mommy needs a fix: buy & carry a double espresso from Java Hut." Yes, of course, I have a coffee carrying ring installed on my handlebars! Finally, browsing through the accompanying photos, I couldn't help be drawn to a picture of two cute fellas sitting in a polka-dotted box of a bakfiets. 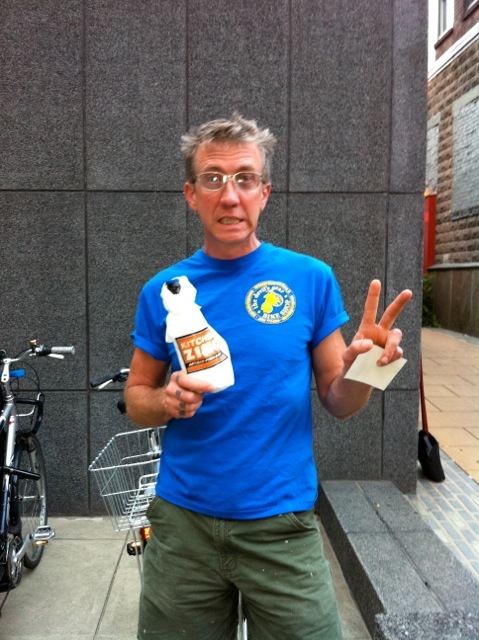 Hey, we are spreading the cargo bike love-- even in Cali. Our recently formed family bicycling group gathered on Saturday, September 10, to join in the CT Folk Festival and Green Expo festivities. Teaming up with kidHaven.com, we set up our own booth at the Expo and gathered together as many family biking set-ups that we could. While other cities may call similar events "Cargo Bike Roll Calls," we rifted off those popular kid events called Touch-a-Truck. What an amazing time we had! We were thrilled with the cargo bikes represented: multiple Xtracycles, two Madsens, a Yuba Mundo, two different cargo trikes, a family tandem, etc. We had back and front-mounted child carrier seats and some bike trailers. Lots of people stopped by to test out the bikes and talk family bicycling and cargo bikes. It was an affirming day for those of us who have been riding with our families. Interest is high and true community is forming. A highlight -- riding to and from the park with other cargo bicycling families as we had a line of seven cargo bikes cruising across town. Thinking back to our first solo days out on the streets with our bakfiets nearly three years ago, this felt BIG. Hey! Recognize anyone on page 33 of the newest edition of Momentum Mag? We also appreciate the mini-feature on Momentum Mag's blog. Thanks, Anna Bowen. It's our first attempt at a full gathering of local cargo bikes. And it's next weekend. To share that I am a bit nervous about it all, would be an understatement. School begins Tuesday. Some local areas are still without power almost a week after Hurrican Irene. I don't have a complete sense of who will be there and with what bikes. But we are going for it! Three years ago, such an event here would be unthinkable. But now, we've seen such an increase of interest and equipment in/for family bicycling 'round these parts. Now, we are not the only nutty family with multiple cargo bikes in the area. So we've made an attempt to organize and entice others to see what fun can be had as a family getting around town on two (and for some, three) wheels. Check out Kidical Mass New Haven's Fb page.